Expectation was running high for the first solo release from a former member of the now disbanded hip-hop legends - A Tribe Called Quest. Although Tribe�s final album The Love Movement was disappointing - Q-Tip stakes a strong claim that he can entertain alone. The tone of the album is slightly more upbeat than you might expect, kicking in with the funky opening track �Wait Up� with its heavily looped guitar riff and electronic stutter. In fact, the pattern of the album is established from the off; taking choice riffs and samples and mixing them with some tough beats. However, a lyric from the more laid back �Lets Ride� says a lot about the diverse mix in sounds which Q-Tip utilises: "listen to the CD�s I play inside� Mos Def, J, Prince and Steve�Marvin Gaye, Led Zeppelin and Biggie." This really emphasises Q-Tip's skill in style selection and the appeal this album will hold for more than the strictly hip-hop fraternity. The samples chosen stick in the mind - particularly on �Things U Do� where they are paralleled with an equally memorable bass line. 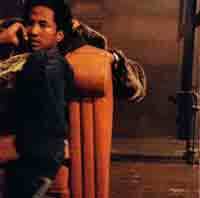 Q-Tip also provides a few laid back moments - such as �All In� - to keep the listener guessing. Constant comparison with past glories from A Tribe Called Quest might seem unfair, but Q-Tip's distinctive rapping style suffers from not being complimented by the alternatives his former group members afforded. The oddly chosen first single �Vivrant Thing� is evidence of this, with the over repetition starting to grate towards the three-minute mark. Late on, the duet with Busta Rhymes on �N.T.� provides a welcome respite. This long awaited variety suggests the album may have benefited from some more guest appearances. Nevertheless, the excellent production throughout more than makes up for any minor complaints about Q-Tip's rapping. As if we haven�t been provided with a big enough treat� here's a Q-Tip: there's a final hidden track - �Do It, Be It, See It�. It's a predictable technique these days but worth the wait: a relaxed, lyric-focused tune shows that Q-Tip has definitely still got what it takes. Which leaves one pointed question: will his former colleagues be able to prove the same?